New work on the Cover and Inside the Jan/Feb issue of Country Living Magazine! I’m very excited to have photographed the cover story for the (current) January/February issue of Country Living Magazine! The beautiful home featured for this story is in the quaint little town of Bel Air, MD. 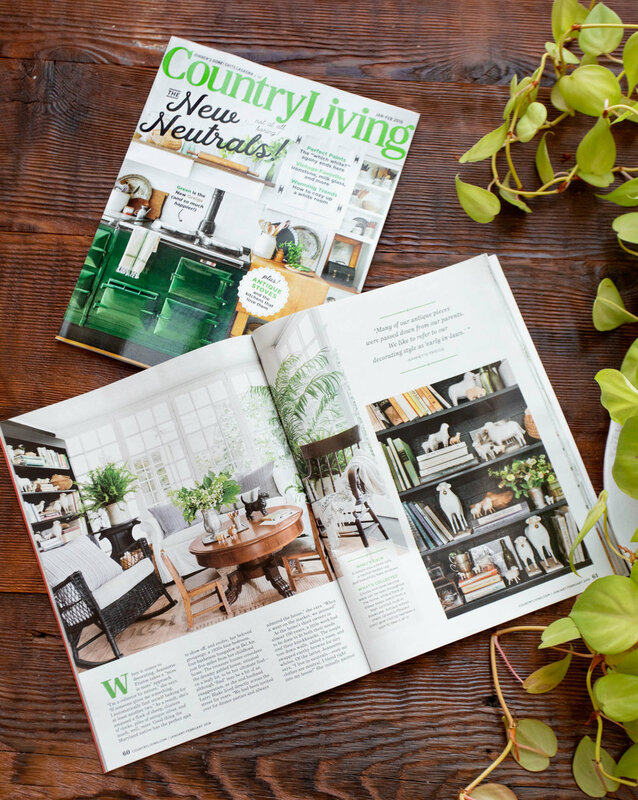 I pitched this home to the fabulous editors at Country Living last March (2018) and they loved it so much that we booked the shoot for a few months later in June! Backing up a little though, I had originally met the homeowner, Jeannette Fristoe 3 years earlier as I was visiting my relatives whom also live in Bel Air. My Aunt and Uncle live 5 minutes away from Jeannette (who knew!) and that one summer when we were visiting, my mother, grandmother and cousin decided to go to a garage sale that was right in town…and yup you guessed it…it was Jeannette’s garage sale! My mother found some glassware for sale there that she loved and struck up a conversation with Jeannette which minutes later somehow led to Jeannette inviting them in to look at her house. It may seem odd but Jeannette is one of those lovely ladies who is made to entertain and is so charmingly hospitable. Next thing I know, I’m getting a text from my mom saying ‘you have to come here and see this house!’. As soon as I walked in, it was love at first sight and I absolutely knew it had to be photographed for a magazine. Fast forward 3 years and I was photographing Jeannette’s home for Country Living Magazine! It seemed surreal at the time and still does to be honest. When I found out back in November that the image of Jeannette’s kitchen would make the cover I was overwhelmed with joy and excitement. Seeing it in print was yet again a wow factor that both Jeannette and I cried over together for a couple minutes! But you really never know who you’ll meet (or how) in this crazy life. Im positive that I was meant to meet Jeannette and I’m so very happy that I did. She is a wonderful woman that truly inspires me and feels like family. Jeannette is so deserving of this cover and I feel so grateful that I was able to capture it through my lens. The ever-so-lovely + incredibly talented Page Mullins was the stylist on this shoot and she did such a great job of making Jeannette’s collected pieces shine. I also love how she incorporated elements of green (esp. the flora/fauna) throughout the images. Since this story is all about green being the new neutral she really tied everything together with subtle pops of the shade. 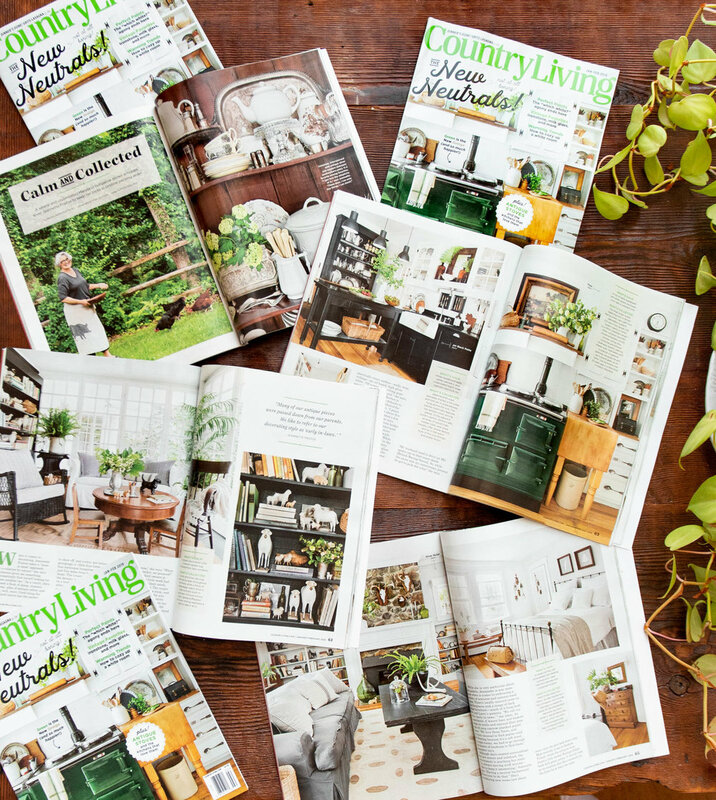 I am so grateful for the editors at Country Living to have given me this opportunity to photograph Jeannette’s home for the magazine and to be considered, let alone chosen, to have an image featured on the cover. It definitely is a career highlight for me and a super sweet start to 2019!